Ryan Christie will not recover from "multiple facial fractures" in time to feature in the Scottish Cup final. 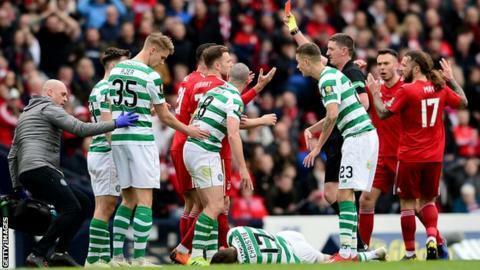 The Celtic midfielder was involved in a collision with Aberdeen's Dominic Ball in Sunday's semi-final. Ball was shown a second yellow for the challenge and Christie is scheduled to undergo surgery on Thursday. "The prognosis isn't good for the rest of the season," explained Lennon, who had said after the game that he hoped Christie could make the 25 May final. "Ryan has multiple fractures of the eye socket, jaw and cheekbone," he told Celtic TV. "He's had a great season, he's a huge player for us and it was a really horrendous collision. "We just have to look after him as best as we can and get him back for the start of next season, and we wish him a speedy recovery." The Scottish Premiership leaders eased to a 3-0 victory over nine-man Aberdeen, who had Lewis Ferguson sent off in the second half for a two-footed tackle, to set up a final meeting with Hearts. Lennon said on Sunday that the decision to send off Ball was the right one. "I don't think there was any deliberation over it. It was a definite second yellow," he told BBC Scotland. Meanwhile, Celtic will play three friendly matches as part of their 10-day pre-season training camp in Austria and Switzerland this summer. They face Austrian lower-league sides SC Pinkafeld on 26 June and Wiener SC three days later before taking on Swiss Super League outfit St Gallen on 2 July.